Crystalwell is a level 4 eDRAM cache of 128MB, it is packaged in a MCM format with the Haswell silicon and is connected via an impressively narrow, double-pumped serial interface. Intel’s Haswell normally only supports 128bit interface for dual channel ddr3 2400MHz ram which has about 40GB/s of transfer speed. 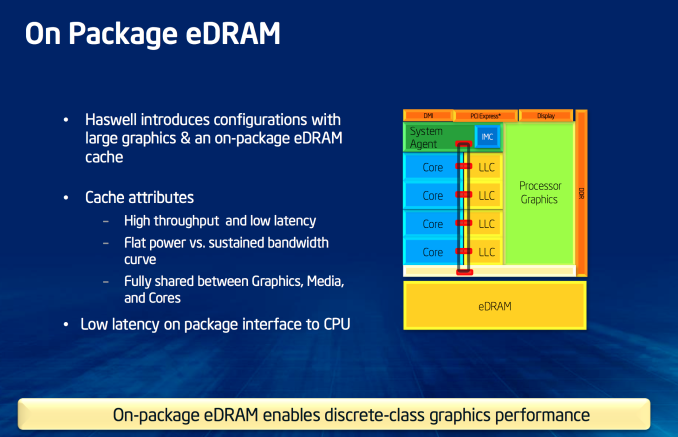 With Crystalwell eDRAM, that is an additional 50GB/s, so an aggregate of around 90GB/s, which to give some perspective is comparable to the 86.4 GB/s of a Nvidias GTX 650 ti with GDDR5 memory(128bit interface). 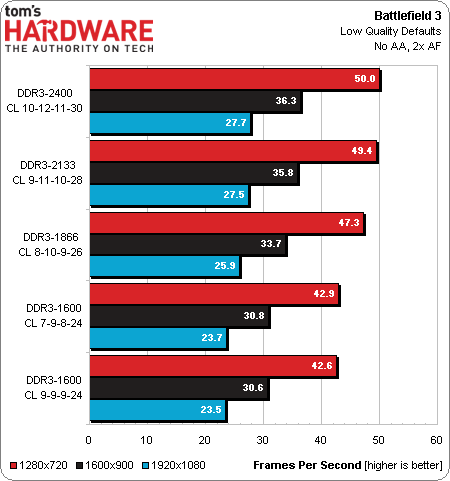 In the graph above, going from ddr3-1600(25GBs) and ddr3-1866(29GBs) to ddr3-2400(38GBs) we can see performance gains. The GPUs architecture is one of many concurrent tasks, while in contrast a CPU is that of a single task, the main difference being that the GPU is relatively slower to complete a single task than the CPU. This massive amount of data has to be fed to complete the array of tasks, so having more bandwidth (GigaBytes Per Second) means that the GPU can spend less time waiting on the data and more time executing it. Crystalwell is Intel’s trump card, feeding the 40 EUs an extra 50GB/s of data in the GT3e iris pro, found in the Core i7-4950HQ. With Crystalwell, the aforementioned Intel i7 can outperform AMDs top trinity part by 20-40%, while using half the power, at the cost of complexity. 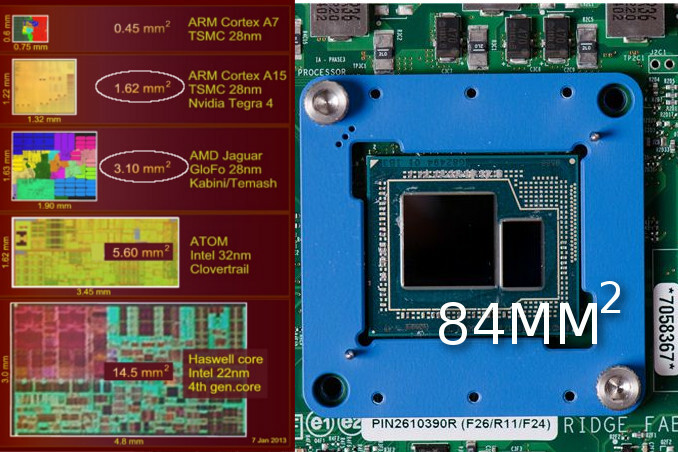 The complexity of this system seems to be the main limitation, the ~85mm2 die size of Crystalwell could well fit around 50 ARM A15 cores. This package also adds a $90 premium on top of the GT3 iris(regular non-edram version), a whopping $468 for the Intel Core i7-4850HQ($657 for the Intel Core i7-4950HQ) quad core/8 thread mobile at 47W TDP. It seems Intel is aiming for premium designs, that are not only power restricted but size restricted, like Apple’s retina macbook line. Intel has flexed their muscles and have knocked AMD out of the top end performer spot in APU rankings, Intel had been hyping Crystalwell and the reveal was pleasantly surprising. Now if Intel would wise up and offer this magical bandwidth cure to their lower end skus. Now we wait for AMDs rebuttal, with this kind of pressure, I wonder what will be AMDs solution? will they use the much rumoured gddr5, triple/quad channel ddr3, ddr4 or packaged memory not dissimilar to Crystalwell. I love the next big thing, that is why I am always on the bleeding edge of technology.